Are you shopping for window coverings in Wilton Manors, FL? Before you choose the products for your home, you need to understand the options that are available. Blinds, shutters, and shades are all popular products. Look at the pros and cons of each design to choose the solution that will be best for your family. Our team at Open House Interiors provides the best products and installation in the industry. We know that you have many options for your home. We want to help you see why our services are leading the competition, giving you the best that money can buy. Not only will we customize your order, but you can rest assured to know that you will receive top-notch products. If you want to improve the quality of your home, then you deserve to work with the best team. We are always here to answer your questions and help with every aspect of replacing the window coverings. You can be educated about products in the industry, giving you the full knowledge to help you make the right decision for your family. Once you have decided to replace the window coverings, the next step is to choose the style of products. Even though homeowners often use these words as synonyms, there are distinct differences between shades, shutters, and blinds. You need to understand these unique features to choose the products that match your preferences. Shutters: These products are some of the most expensive in the industry, but they are often the top choice for homeowners. Shutters offer a great way to improve the elegance of your home in a beautiful, classy way. These products can be designed in many styles and layouts. Plus, you can choose the size of slats, the color of the shutters, and the overall appearance of the window coverings. Most of the time, shutters are designed with a rod down the middle, so you need to move the rod to reposition all the slats simultaneously. Shades: If you are on a tight budget for the home improvement project, then you might choose shades instead of shutters. Shades are designed with a fabric of your choice, which pulls over the surface of the glass when they are closed. 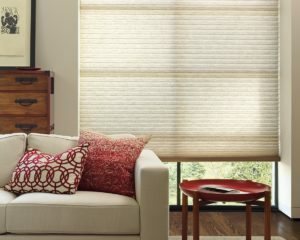 When you open the shades, the fabric often wraps around a rod located at the top or side of the window. Or, the fabric can gather together in pleats to expose the surface of the glass. One benefit to using shades is that you can choose the fabric color and design that will correspond to the other design elements in your home. Blinds: If you are looking for a classic window covering, then blinds might be the best choice. There are many price points in the blinds category, allowing you to choose the materials and features that match your budget. Blinds are usually designed with horizontal slats, although a vertical layout is also available. Some of the products use lightweight, thin slats, while other designs have big, sturdy slats. The best thing that you can do is talk to an expert if you are trying to learn more about the pros and cons of these products. You can visit our showroom to see examples of the window coverings that we sell. Also, feel free to schedule a free in-home consultation so that we can inspect your windows and offer custom recommendations. If you are having a hard time choosing window coverings, then there are a few tips that you can follow. Start by putting together a list of priorities that will match the needs of your family. Consider how simple it will be for kids to use the products. Also, look at the function and ease-of-use for each product. One advantage of choosing shutters over blinds or shades is that you can have a cord-free installation in your home. If you have children or pets, the cords on the blinds or shades could pose a dangerous situation. There are instances where small children or animals have been caught and hung when the cords were near furniture. But, these features might not be important if you don’t have children in the house. Schedule a consultation when you are ready to get started with your new window coverings. We have a showroom full of examples and products that can be used on your property. Or, you are welcome to bring in pictures that you find online. We can use these images to choose materials that match the style that you would like to create.